Electric Thermal Storage (ETS) is a heat storage technology that can reduce home heating costs where time-of-use (TOU) or low, off-peak rates are offered. Where such rates are available, electricity is most expensive during the day-time hours when the demand for power is the highest. ETS shifts the home's heating load from the higher-cost, on-peak hours to the less-expensive, off-peak hours thereby reducing electricity costs. 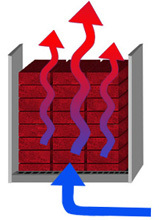 In the most common ETS systems, heat produced with electricity during off-peak times is stored in dense ceramic bricks. When heat is needed, a blower moves the heat from the bricks to the living space. In addition to individual room heating units, other ETS products available today include heat pump boosters, hydronic heating systems and forced air furnaces. In recent years, as the installation of heat pumps in colder climates has grown, ETS is finding a place helping them attain the optimal economical operation. Heat pumps provide extremely high energy efficiencies, but as outdoor temperatures fall, so does their efficiency. At some point the heat pump can no longer keep the home at a comfortable temperature on its own and a supplemental or back-up heat source is needed. When the back-up is provided by resistance electric heat, the resistance heat uses the standard electric rate, which is generally two times higher than the off-peak rate. Using ETS, which has stored less-expensive heat produced off-peak, as a heat pump booster replaces the need for direct resistance heat at times when prices are higher. The heat pump booster can also deliver a higher level of constant comfort in the home by continually monitoring duct temperatures and injecting as much heat as necessary to keep the home comfortable. ETS can make electric heating cost-competitive with fossil fuels. Where affordable, off-peak electric rates are offered, customers may be able to save significant money by converting to ETS heating in lieu of their propane heaters, natural gas heaters, wood stoves or fire places. 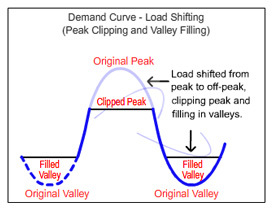 The savings using the ETS system are largely influenced by three factors: the differential between the utility's on-peak and off-peak rates, the length of time each day that is off-peak, and the annual amount of home heating needed.